Electronic sirens have a number of essential parameters and characteristics that greatly affect their functionality, effectiveness, and possibilities. The first question that arises is usually the same: What is the acoustic coverage of a siren? When looking for the answer, a seemingly simple solution comes into the foreground: to collect leaflets of various siren producers, find specific parameter values, and order them unthinkingly from the greatest to the smallest. However, this approach to the problem is too simplistic. The parameter of acoustic coverage, if expressed by a single figure, hardly ever corresponds to the reality since the final result is always influenced by multiple factors, such as terrain conditions, building density, background noise, heights of siren horn installations, etc. Therefore, the Telegrafia company has developed a unique and very efficient solution: the Acusticus Professional web application, available free of charge for 24 hours a day. Thanks to its flexibility and versatility, it can be used to visualise the acoustic coverage of a siren in ideal conditions quickly and easily. Moreover, it is possible to use this application for the creation of a complex professional acoustic project and cover any endangered area with acoustic signal. In the first case, i.e. 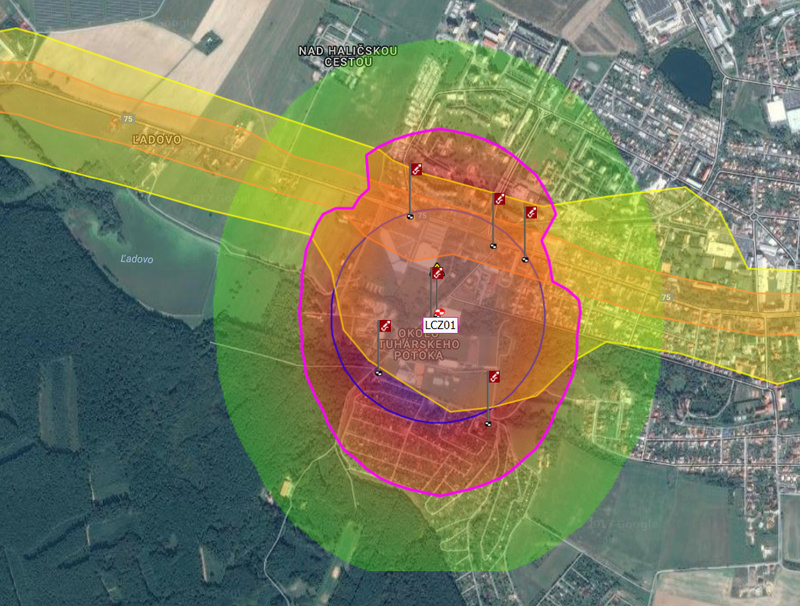 to visualise the acoustic coverage of a siren in ideal conditions, it is sufficient to place a siren on the Google Maps background and its acoustic coverage is clearly graphically displayed. Even though it is the very basic parameter, it can be obtained quickly, within a couple of seconds, and the information in this form is perfectly comprehensible (when compared to a chart filled with lots of figures, for example). In the other case, i.e. to simulate the reality as close as possible, several more advanced functions of the Acusticus Professional web application are available. They can be used to include several background noise zones with different noise levels into the acoustic coverage plan for a specific endangered area, take into account the building density effect, and other parameters having an impact on sound transmission. By including all these effects into the acoustic project, it is possible to arrange the desired warning devices precisely enough to fully reflect the specifics of the endangered area. If you are seriously interested in finding detailed information about the acoustic coverage of any endangered area while using Telegrafia’s sirens and other acoustic warning systems, try the Acusticus Professional software application. Instead of an academic answer containing complex data, you will simply obtain solicited information in the well-comprehensible graphical form, shown on the map background, and the positions and coverages of warning devices on the map will exactly correspond to those you planned in your project. Should you have any other enquiries about Telegrafia’s early warning and emergency notification systems, feel free to contact the company and ask for professional advice.